When a car is assembled in a factory, industrial and generally automated painters are used to apply the final coat of paint to each vehicle. However, at most auto body shops, this type of assembly line automation does not exist. Instead, human hands repair and refinish the vehicle back to factory standards. A key tool used in auto body shops to refinish the paint is a paint booth. There are three important reasons why having a paint booth is important to a successful auto body shop. When wet paint is sprayed on a vehicle, it can become a magnet for dirt, bugs, dust and debris that fly through the air in the shop. This dirt and debris can get quickly embedded into the paint if it isn’t painted in an clean, enclosed environment. A paint booth provides the necessary clean environment for the refinishing technician to paint in to avoid contaminants. Automotive paint is a hazardous material and utilizing a paint booth ensures the fumes and over spray from the paint remain contained in an enclosed area which will keep all shop employees safe. Improper application can be a fire hazard. Using the appropriate filter in the booth also ensures that any contaminants do not damage the paint. Using the most current technology available in the industry to construct and maintain paint booths will make the painting application and curing process as efficient as possible. 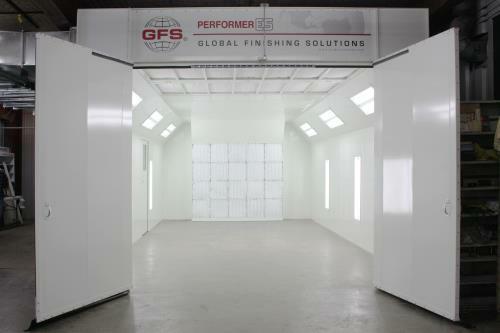 WD Services has been in the business providing excellent service selling paint booths for over 30 years. A distributor of Global Finishing Services, WD Services uses top of the line products and technology with outstanding service to it’s customers. Contact us today and we are happy to help you through the process of planning and purchasing a paint booth for your business.